The Buddhist Mistress Ng Mui was the only female in the Siu Lam Monastery and the eldest among the Five Elders. She was more tolerant towards the Manchu Governement than her kung-fu brothers and their hot-tempered disciples, (though of course would sometimes apply physicel power if necessary, in order to maintain justice). Ng Mui went travelling about the country after the destruction of the Siu Lam Monastery, determined never to become involved in mundane affairs again. At first she settled down in the White Crane Temple, at Tai Leung Mountain (also called Chai Ha Mountain), a sparsely populated mountain on the border between the provinces of Szechwan and Yunnan. There, being seldom disturbed, she concentrated on Zen Buddhism, a sect of Buddhism originated by Bodhidharma during the Northern and Southern Dynasties, and also martial arts, as her favourite pastime. Ng Mui, like her kung-fu brothers, who were then separated from each other, never forgot the bitter experience they suffered from the fire at Siu Lam, and the teacherous defectors who turned to the Manchu Government. Besides, she had another worry too. That was, how they could defend themselves from further attacks of the skilful Siu Lam defectors and the Manchu Government. 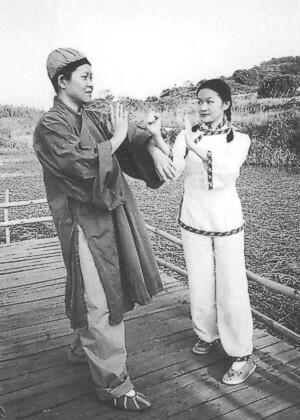 She knew the difficulty of overcoming these defectors of Siu Lam, who had during the past years mastered most of the techniques of Siu Lam Kung-fu, that at the moment she herself excelled over them in skilful techniques only, but her knowledge of theories being only equal to the defectors, she worried that one day her strength would fail to overcome the more powerful younger Siu Lam defectors. The only way to defeat them was to create a new fighting system that would overcome the existing Siu Lam techniques. But what? And how? These were the questions that troubled her at this time. Her chance came one day, when she witnessed a fight between a fox and a large wild crane. The fox ran around the crane in a circle, hoping to get a chance of launching a fatal attack. The crane stayed at the centre of the circle, turning all the time to face the fox. Each time the fox came near the crane to attack with its paw, the crane would block the fox’s paw with one of its wings, and at the same time rendered a counter-attack with its beak. So the crane kept defending itself with its wings and rendering counter-attacks with its beak. The cunning fox took advantage of its running speed and strove to make surprise attacks with its paws. So the fight continued for quite a long time under the observation of Ng Mui. Which one was the victor is not the important question. It did however give a hint to Ng Mui – an inspiration initiating a new fighting system.